The Bosch Fiber Optic Series are transmission products that provide efficient, high quality video and data transmission via fiber optic cable. Fiber optic signals are immune to ground loops, radio frequency interference (RFI), electromagnetic interference (EMI), and cross talk because the video carrier is infrared light and is transmitted through a nonconductive fiber optic cable. Interference-free operation ensures reliable service. Unlike microwave, wire, and coaxial cable transmission systems, fiber optic transmission is difficult, if not impossible to tap. And, since fiber optic cable is nonconductive and does not radiate a signal, it is difficult to detect and locate. 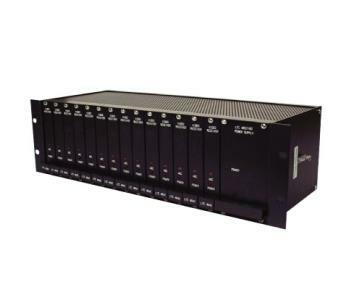 These compact devices are available in a surface mount enclosure or in a modular style package that can be rack-mounted using an optional EIA 48 cm (19 in.) compatible rack unit. NOTE: Specifications noted below apply to all models unless otherwise specified in applicable model section. LTC 4600/00 blank panel (1 rack slot). Used to cover unused slots in LTC 4637 Series racks.